Three Boy Circus: Toilet Paper Dress For Your Wedding Day?! 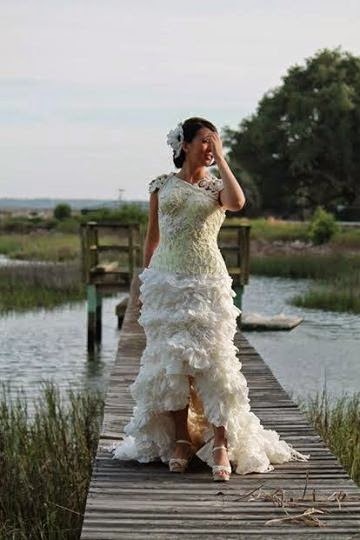 Toilet Paper Dress For Your Wedding Day?! These are just 2 of the finalists. Go and check out the others and vote for your favorites! Stay tuned for the announcement of this year's winner! Lol, my mind was too! Crazy. What do they wear under it? What happens if someone spills a drink? It's hard to believe those dresses were made out of toilet paper! Yeah, they look amazing! :) Thank you for stopping by, Amberly. Oh my gosh, unreal! I would have proudly worn any of those dresses! Hard to believe they're made of TP! I cannot believe they are made out of toilet paper! What if they get wet?! Yeah, I didn't think of that lol. Or what if the wedding gets a sudden downpour?! Oh my goodness! Those dresses are incredible! I can't believe they are made out of toilet paper! :) Yes, so surprising! thanks for stopping by, Kasi! Crazy!! Those dresses are gorgeous! Lol, yeah, crazy talented people. Who would have thought! I think that's a lot of talent!! I cannot imagine trying to make one! They turned out so awesome! I can't imagine it either. No buttons, or even Velcro? Wow. I did at the awesome-ness of these dresses! Toilet paper?! Mindblown! There's no way those are made from toilet paper! That's so crazy - they look great! Wow! I cannot believe what people come up with using just TP! LMAO Amber. :D These are pretty great though. Very talented ladies.